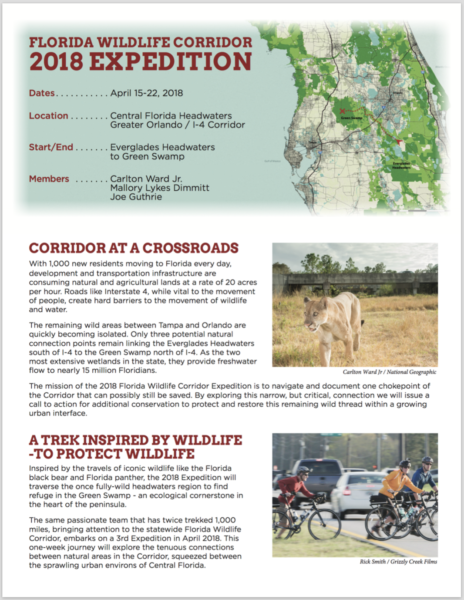 The Florida Wildlife Corridor is a statewide vision to keep Florida wild by integrating Florida’s leading conservation science with compelling storytelling to raise awareness about the Corridor and the need to connect and protect it. Our Expeditions in 2012 and 2015 laid the foundation for this work with a robust media campaign to share the Corridor concept and vision (Re-live the journey). The Florida Wildlife Corridor now embarks on its most important journey – protecting 300,000 acres within the Corridor by the end of 2020. The same passionate team that has twice trekked 1,000 miles, bringing attention to the statewide Florida Wildlife Corridor, embarked on a 3rd Expedition in April 2018. This one-week journey explored the tenuous connections between natural areas in the Corridor, squeezed between the sprawling urban environs of Central Florida. Spread the word! Download and share this flyer to help every step of the trek reach further. With 1,000 new residents moving to Florida every day, development and transportation infrastructure are consuming natural and agricultural lands at a rate of 20 acres per hour. Roads like Interstate 4, while vital to the movement of people, create hard barriers to the movement of wildlife and water. The remaining wild areas between Tampa and Orlando are quickly becoming isolated. Only three potential natural connection points remain linking the Everglades Headwaters south of I-4 to the Green Swamp north of I-4. As the two most extensive wetlands in the state, they provide freshwater flow to nearly 15 million Floridians. The mission of the 2018 Florida Wildlife Corridor Expedition was to navigate and document one chokepoint of the Corridor that can possibly still be saved. 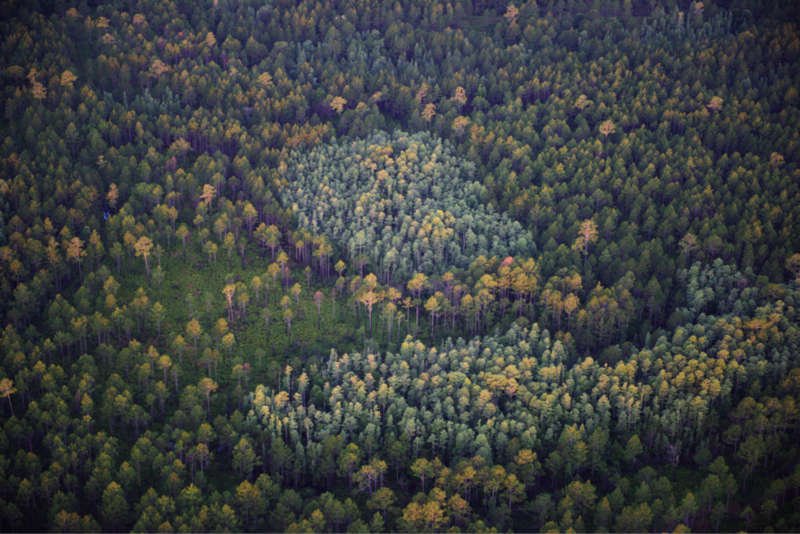 By exploring this narrow, but critical, connection we issue a call to action for additional conservation to protect and restore this remaining wild thread within a growing urban interface. 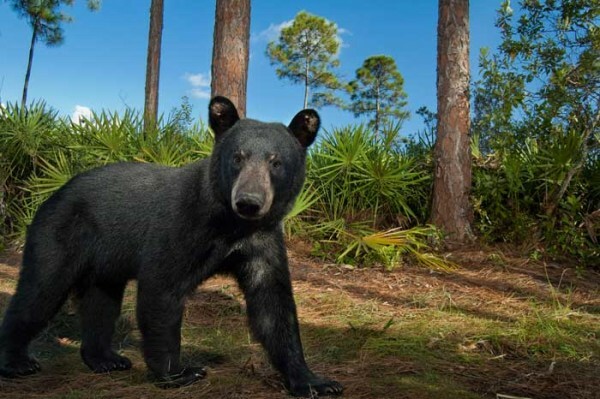 Florida’s black bears require many different habitats throughout the year to find food and mates. Their travels are accomplished through corridors that connect the hotspots that support their diet. Photo by Carlton Ward. Inspired by the travels of iconic wildlife like the Florida black bear and Florida panther, the 2018 Expedition traversed the once fully-wild headwaters region to find refuge in the Green Swamp – an ecological cornerstone in the heart of the peninsula. 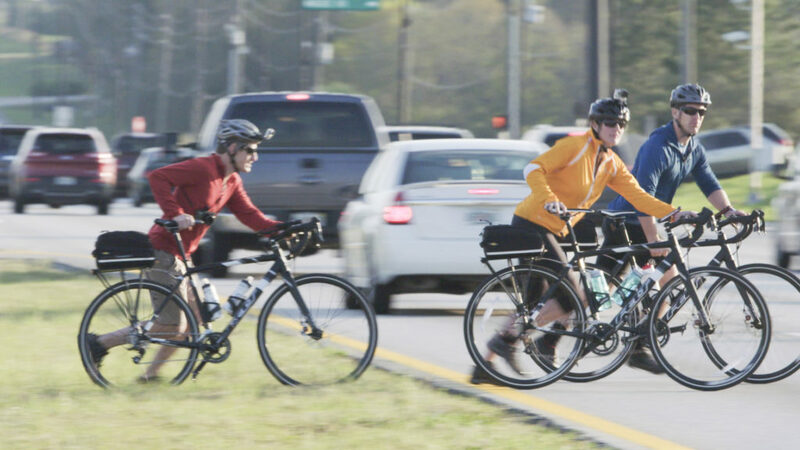 This central Florida region may be the greatest risk to survival of the Corridor, a crossroads in the center of the peninsula with an already weak connection. Re-visiting this nexus is a strategic check-up on the health of the ecological “heart” to ensure the flow of wildlife and water to all parts of the Corridor. As the headwaters for the four central Florida rivers, this area supplies flow to residents in all directions throughout the state, connecting to Tampa Bay, the Nature Coast, Jacksonville and Miami. The Greater Green Swamp provides the headwaters four major rivers – the Hillsborough, Withlacoochee, Peace and Ocklawaha. The Greater Green Swamp includes the headwaters four major rivers – the Hillsborough, Withlacoochee, Peace and Ocklawaha, serving 3 million residents in the greater Tampa Bay area and a million more in greater Ft. Myers and Charlotte Harbor. On its way to the St Johns River, the Ocklawaha provides water for populations in central and eastern Florida, from Ocala to Jacksonville. To the south, the Green Swamp’s watershed links to the northern Everglades region, the source of freshwater for more than 8 million residents. Part of the Expedition’s purpose was to inform ways to enhance or restore connectivity for wildlife and water supply. Daily ecological surveys tracked wildlife and water; the team focused on identifying local biological hotspots to suggest ways that others can help monitor the health of the Corridor in years to come. Your generous donation will help cover costs of this urgently-needed check on the health of the Corridor. Without improved connectivity and safe wildlife passages, these fragile threads of natural habitat where wildlife cross I-4 may be lost forever. Please help us inspire the necessary conservation before it’s too late. The future of wildlife and water supply depends on keeping the Corridor connected! Please give generously. Track the Expedition’s daily updates through blogs and social media posting, and in-depth coverage in regional media outlets (see media page.). Share the short film that will follow the journey. With your help, these products will engage and mobilize strong support for connecting and protecting the Florida Wildlife Corridor. The generous support of these sponsors is instrumental to the success and growth of the Florida Wildlife Corridor Expedition and the goal of conserving Florida’s natural environment and wildlife corridors. Add your show of support to the gallery. See how by downloading our Sponsorship package.